President Barack Obama loves to talk about the great promise of energy reform, but all it takes is one glance down Pennsylvania Avenue to get a sense of the pitfalls of such ambitious designs. That was especially clear on Tuesday, as Congress ran both hot and cold on legislation to fight global warming. "I don't think what [Waxman] is proposing will get 60 votes in the Senate," said Senator Joe Lieberman, a Connecticut Independent who has championed global-warming legislation for years. "The early targets are high  higher than the Senate will accept and higher than what we can do, because they impose too much of a burden, particularly on people in states that burn a lot of coal or produce a lot of electricity." 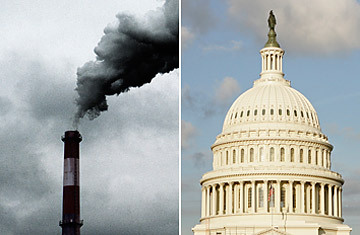 Recognizing that their bill was just an opening gambit, the two House Democrats notably left open one of the most controversial questions: whether, under a carbon cap-and-trade system, to auction off pollution credits to companies, as Obama's plan would do with 100% of them, or to give away some or all at no cost. If even a portion of the credits are auctioned off, the scheme could produce hundreds of billions of dollars in revenues, since almost every big company in America would need to buy the credits to initially comply with the more stringent standards. But most Republicans and many Democrats are demanding those potential funds be returned directly to consumers to help offset higher energy bills as utilities pass along to them the cost of modernizing. The Obama plan, however, envisions using 20% of these funds to pay for investments in green technologies and green jobs. "My first priority is that the money goes back to help those who will see their costs increased, whether it's consumers or manufacturers," said Senator Debbie Stabenow, a Michigan Democrat who voted for the amendment Tuesday. At the same time, the Senate is also expected this week to consider other energy amendments to the budget resolution being crafted. The House version of the budget, which is just a rough, nonbinding blueprint for Congress' spending priorities in the coming fiscal year, includes a provision that would allow health-care legislation to pass the Senate with a simple majority of 51 votes. Democrats have uniformly said they have no intention of piggybacking an energy bill in the same way, though the provision is sufficiently vague to allow for such a move. Just in case Democrats change their minds, an amendment being offered this week by Nebraska Republican Mike Johanns would bar the inclusion of climate-change legislation in the final budget. The jockeying around these amendments in the Senate  which are nonbinding, like the overall budget plan  speaks to how intense the energy-reform maneuvering is already. The fact that the amendments  several more of which are in the pipeline  are coming through the Senate shows the impatience of members of the upper chamber, since the Senate will most likely wait for the House to act rather than draft its own bill. And there remain many holes to be filled in the House bill. The Waxman-Markey bill, for instance, doesn't tackle nuclear power, a key issue for Republicans. And it doesn't set specific timetables for greenhouse-gas reductions or address international concerns about how the U.S. would handle climate change across borders. "I think the process here will be informed to some extent by what happens in the House, and we'll learn from what they're trying to get done," said Senator Tom Carper, a Delaware Democrat and longtime sponsor of climate-change legislation in the Senate. "My hope and belief is, by the time we break for August recess, we'll have had the opportunity to bring the bill to the [Senate] floor and hopefully start debating it."